Many diets were harmed in the making of this article. With so many debates going on these days, it’s hard to find meaningful discourse sometimes. At Reviewed, our arguments are just as heated as any, but when we argue, we back it up with logic and science. So when got deep into a discussion about the best chips one day, we knew there was only one way to settle it. 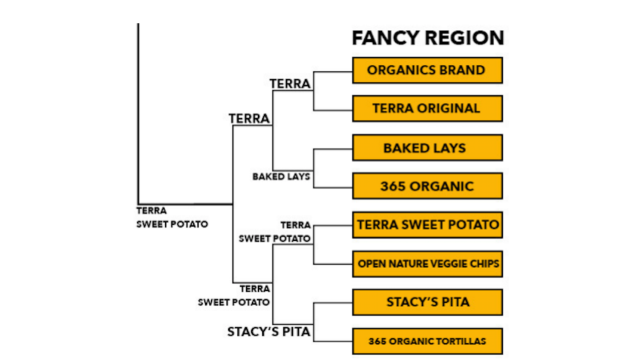 As bracket season rolled around in March, we went to the local stores and bought 32 different kinds of chips organized into four “regions” based on the kind of chip and set out to taste test and find a winner. After five days of chip testing, countless stomach aches and lots of crumbs, we came to a final four with the best of each region (salt, flavor, corn and fancy) and then eventually decided upon the best chip of the bunch. There were very few blowouts, a couple upsets and a lot of crunching, so here’s how it all shook out. 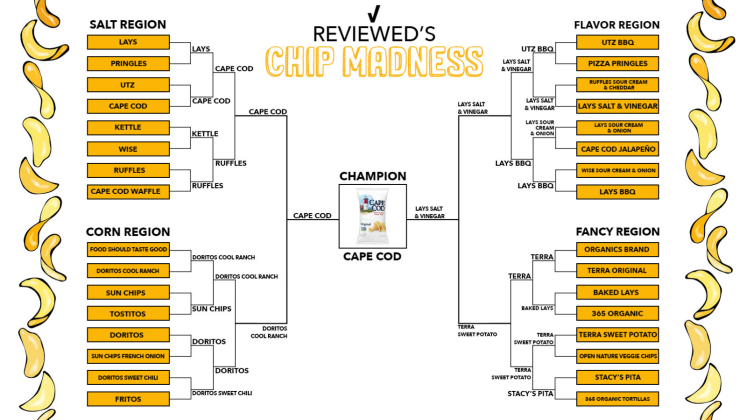 Cape Cod chips had to be one of the favorites coming in and it proved itself at every turn, defeating tough tests like Lays, Ruffles and Doritos Cool Ranch before taking down Lays Salt and Vinegar in the finals. What our testers loved most about this chip was its crunch, which was better than most of the other chips in the tournament along with its kettle cooked tasted and the perfect amount of salt. Many testers remarked that it was one of the chips they could eat an entire bowl of and then some and it was one of the plates they came back to for a handful after voting. 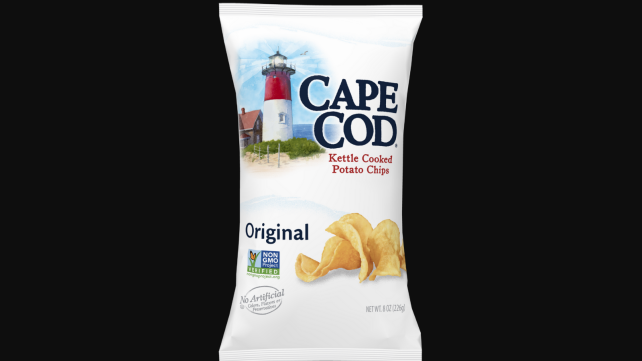 While its counterparts in Cape Cod Jalopeño and Waffle Cut were good, the original was the best of the potato chips for sure and earned its place as the best overall chip out of the 32 we tried. 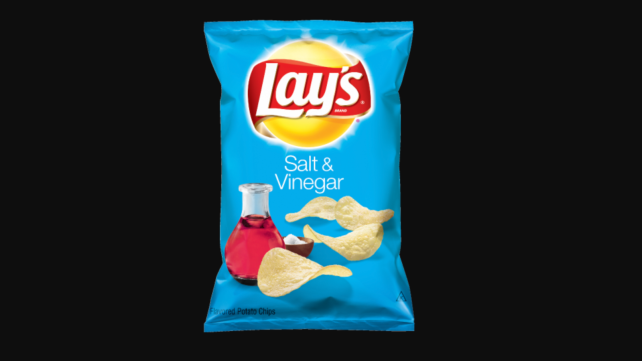 A surprise from the start, Lays Salt and Vinegar took out two giants on the way to the finals including Lays Barbecue in the third round and Ruffles Sour Cream and Cheddar early on. People were very split on the chip, as testers loved it or hated it and had we tallied opinions another way, they may not have made it as far, but it did and those who liked it enjoyed its unique kick of vinegar that was incredibly addictive. In the third round, everyone loved the orange dust of the BBQ flavor, but when it came down to it, salt and vinegar was overpowering both figuratively and literally. The corn region consisted of some of the best chips in the whole bracket all in one corner, so to come out of that as the best takes some serious bite. 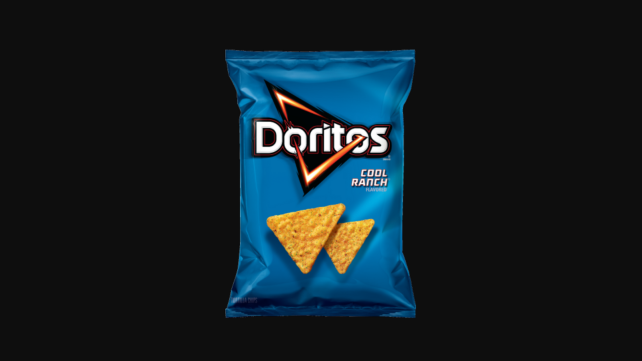 Cool Ranch toppled Doritos Nacho flavor in an epic struggle for Doritos superiority as testers found the addictive flavor with a little bite better than the rest, plus they had less dust on their fingers for their efforts. In what was probably the least-popular region in terms of testers trying to sneak seconds, it was another brand-brother matchup as Terra Sweet Potato took down Terra Original for the crown. In the end, it was the consistency of the sweet potato flavor and the crunch that did the job as Terra Original’s mix was too much to decipher with veggies/potatos we literally didn't even know existed like taro, yuca and batata. The salt region was the basic potato chip region. There were few frills, just cut potatoes fried and covered in salt. Lays: Perhaps the most well-known chip of the entire bracket, Lays couldn’t keep up with Cape Cod despite its patented crunch, and salt that left a little grease on the fingertips. Kettle Chips: After a surprise win over Wise, Kettle Chips almost knocked off Ruffles. Like Cape Cod chips, Kettle had some extra crunch, but lacked in salt and lost out to the ridges. Pringles: A hit-or-miss for sure, Pringles put up a fight against Lays but the powdery potato chip fell short. 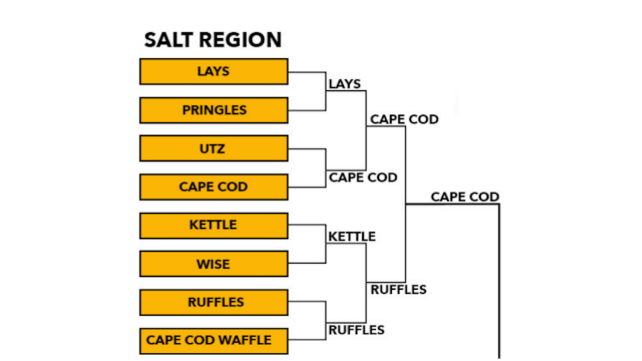 Utz: The Lays-like chip came oh-so-close to unseating Cape Cod in round one and likely would’ve made noise had it gone against another opponent with its soft crunch and salt but all we can say is what could’ve been. Wise: Wise was another that came down to a close vote but its unoriginality was its undoing much like Utz. Cape Cod Waffle: For all the hype, Ruffles exploited the many holes in this chip. This region consisted of flavored potato chips and we tried to bring multiple different flavors from multiple brands into the mix. Utz Honey Barbeque: The flavor was great and the orange dust left some to lick off your fingers, but it couldn’t hold a candle to Lays Salt and Vinegar. Lays Sour Cream and Onion: Of the two sour cream and onion chips we tested, these may have had less flavor and got easily defeated by Lays BBQ. Pizza Pringles: Maybe one of the more niche chips in the bracket, they were solid, but didn’t really taste like pizza and fell to Utz BBQ. 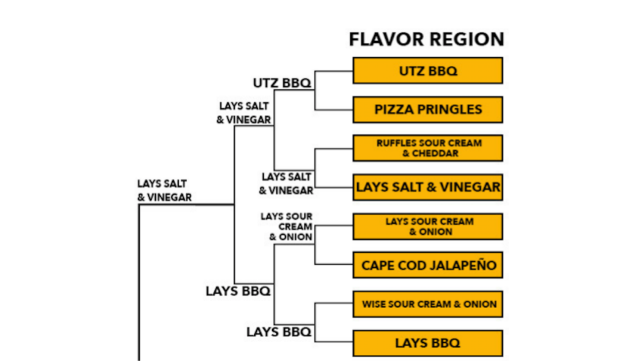 Ruffles Sour Cream and Cheddar: Of all the chips in the bracket, this first-round upset was surprising at first as the popular cheesy-but-sour chip fell to Lays Salt and Vinegar by the tiniest of margins. As the bracket went on though, it became obvious that it lost to a giant. Had it drawn an easier opponent, we could’ve seen this popular pick in the later rounds. Cape Cod Jalopeño: It was crunchy, flavorful and spicy, but enough testers weren’t a fan of the heat that it fell to Lays Sour Cream and Onion. Wise Ridges Sour Cream and Onion: The standard sour cream and onion flavor and ridges were no match for the overpowering Lays BBQ flavor. The corn region’s name speaks for itself, with both plain and flavored chips in the mix. Sun Chips: A fan favorite, Sun Chips are a big hit around the Reviewed office for their unique multi-grain style and flavor, but its flavor wasn’t enough against Cool Ranch Doritos. Doritos Sweet Chili: Doritos Sweet Chili opened a lot of eyes around the office for its sweet and spicy flavor with a nice kick, but it finished third in the Doritos family as the nacho flavor took it down due to pure nostalgia and consistency. Food Should Taste Good Blue Corn Tortilla Chips: Blue corn tortilla chips stood no chance against Doritos Cool Ranch, but are a viable tortilla chip option nonetheless. Tostitos: The other tortilla chip in this part of the bracket went up against Sun Chips in the first round and hung in there, but was too ordinary for our testers. Sun Chips French Onion: There were arguments for Harvest Cheddar to be in this spot and maybe they were correct. 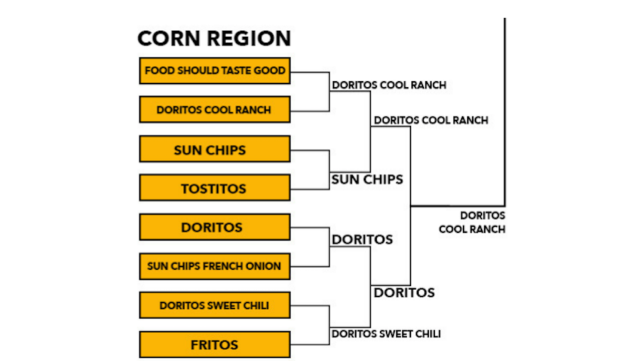 Nonetheless, it’s safe to say Doritos Nacho flavor likely would’ve won regardless. Fritos: In another close battle, Doritos Sweet Chili’s flavor topped a classic in Fritos. Our tester’s stances were either very pro-Fritos or anti-Fritos, which hurt it in voting. The fancy region featured the biggest variety of chips with organic chips, veggie chips, potato chips, pita chips and organic tortilla chips to make sure to encompass all of your options. Baked Lays: There two different kinds of Lays we could’ve put in with Kettle Lays or Baked and we chose baked. People immediately noted that regular Lays were better and these Lays weren’t enough to get past Terra Original. Stacy’s Pita: Like Fritos, Stacy’s Pita chips were hit-or-miss as some said they would’ve voted for them if there was a nice dip with them, but on their own, they were bland. Organics Potato Chips: These chips were your standard potato chip sans a little salt and just couldn’t compete with the flavor of Terra Original. Whole Foods Organic Potato Chips: When matched up with Organics, it would’ve been hard to tell the two apart and for that reason Baked Lays with a little bit more flavor and salt won out. 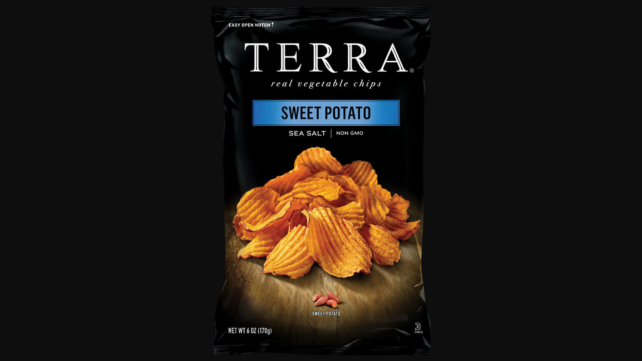 Open Nature Veggie Chips: This was a popular and well-known chip that might’ve been predicted to make a run, but ran into Terra Sweet Potato and lost in a close battle. Whole Foods Organic Tortilla Chips: This was another very close battle against Stacy’s Pita but with little salt, the chips were bland and that hurt them. -As noted above, had the bracket (which was randomized to avoid biased seeding) been set differently, we may have seen different chips in different places, but that’s the nature with any tournament and the cream (but not sour cream, apparently) of the crop always rises to the top regardless. -We also organized the regions to ensure that each type of chip got its shine and to determine the best of each kind, which is arguably as important as the best overall. We never would’ve gotten the best of the fancy chips had they been matched up against Doritos or Lays in the first round. -Yes, we probably left out your favorite chip, but our goal was to get the broadest selection possible. We wanted to expand our chip palate and you should too! -If you’re going to do your own test at home, we recommend you show more restraint in testing chips than we did to save you from stomach aches down the line. One chip per test and put them away right after to avoid reaching in the bag.